This thread details all you'll need to build an Ultrastar song from scratch. a music video, preferably in 720p. You want this to read "No". VBR stands for Variable Bit Rate. Good for sound quality, bad for working with karaoke games. If it reads "Yes", use the converter. That one's pretty straightforward, you just need to move the registration banner out of the way if you use the trial version. Left is the header information. The program will read in every information provided by the MP3, so Artist and Title will mostly be carried over automatically. You should put your own name under Creator. BPM and Gap will be determined automatically. You don't need to concern yourself with the rest, we will do that during our quality check. 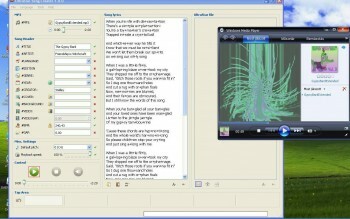 Delete the stuff from the "Song lyrics" window and copy in your lyrics. First things first, you should check if your lines are well spaced. Sometimes, lyrics found online have awkward linebreaks. Next, play the song and check word for word if the written lyrics match the song. Some transcripts have added, removed or changed words. It's mostly an oversight, but you will want all words to fit correctly. Now to break up the words to syllables. USC recognizes seperate words as such, but longer words will have several notes and (potentially) pitches associated with them. You have to do this manually, by entering a + into the words. 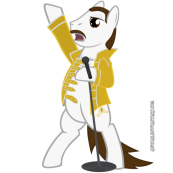 If you have spoken words in your song (like, say, Rarity's barter with her friends in "Art of the Dress"), you can choose whether or not to split those up. There may also be words with elongated notes, were one syllable is repeated with multiple pitches. a) By doubling the vowel and linking it with a "-", making it "da-a-a-ay" in our example. Note that you'll have to put +-s there as well, making it "da+-a+-a+-ay"
b) By writing out the syllable, then adding a ~ for every additional pitch, so "day+~+~+~". This becomes awkward when it's in the middle of a word, like in the last (sung) word of the Crystal Fair Song, where it becomes "his+to+~+ry", or in the finished game, "histo~ry"
Once everything's in place, start the song and lyrics with the play button highlighted in red. Click the Tap button or press the Space Bar everytime a syllable plays. You don't need to be completely accurate; this just forms a rough outline that you'll use in USDX. If the song's too fast for you, you can adjust the Playback Speed in the Misc. Settings menu. If you miss a note or are too early on one, you can hit the rewind button and/or use the playback slider. Just don't overuse it, as it can lead to incorrectly placed linebreaks. You can correct those later, though. When you're done, you can save the tapping in a .txt file with the floppy icon highlighted in blue. This will create an "*Artist* - *Title*.txt" in the same folder as the mp3. Open your Ultrastar Deluxe song-folder, create a new folder inside and put the mp3 and the txt in that. If you have images and/or a video, you can put those in as well. - Holding SHIFT and using the cursors moves the note around. Left/Right change its position, Up/Down its pitch. - Holding CTRL and pressing Left/Right extends/contracts the beginning of a note, holding ALT does the same to the end. - Holding CTRL, ALT and SHIFT grabs the highlighted note and every note after it, and moves them with Left/Right. - Pressing Space Bar lets you hear the currently highlighted note in the song. - Holding SHIFT and pressing the Space Bar plays the current note's pitch with a piano tune. 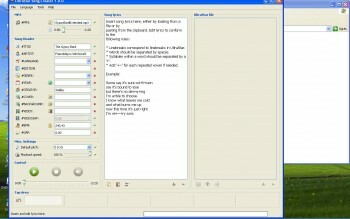 - Pressing P lets you hear the current line in the song. The audiable clicks represent the beginnings of the notes. Pressing P while holding SHIFT plays the pitches of the whole line. - To save your changes, press S. You'll use this a lot. First, check the BPM. That's the Beats Per Minute, and you can only change note positions by one beat. If it's below 300, you might have problems finetuning the song. If it is, press SHIFT+M to double the beat count, without changing any note positions. Let's start editing the song. For now, only concern yourself with the position. Extend the first note up to the second, and give it a listen. Now, position the note so that you hear that one syllable. Note that there are some sounds in the spoken language that don't carry a pitch, like "S", "F" and "Th" (don't believe me? Go on, try singing a high-pitched S). Keep those as short as possible in your notes. Rinse and repeat for every other note in the first line. As a rule of thumb, every note should be at least two beats long and there should be at least one beat pause between notes. This is not a hard rule, but something that makes singing much easier and more realistic, especially on higher difficulties. Press P to check if every note's start matches up with the words sung. Now go back to the first note and check the "Start" entry, highlighted in red in the image above. It should be 0 or higher. If it's negative, hold CTRL, ALT and SHIFT and move the whole song to the right until you reach 0. 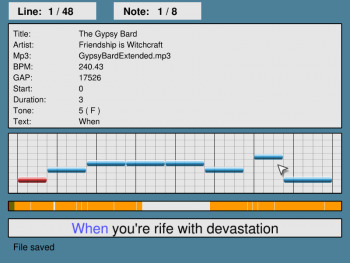 Now you have to adjust the Gap (highlighted in blue) until the song matches the notes again. Do this by pressing 9 and 0 on the main keyboard area (not the Numpad) to adjust the gap by 10 ms, and CTRL+9 and 0 to shift it by a whole second. Once the notes match up again, you can move to the next line. Check that you don't have overlapping notes between lines by highlighting the last note of a line, adding up the Start and Duration numbers, and comparing it to the next note's Start. Rinse, repeat until all lines are in place. You might realize now that you missed a word or need an additional pitch for an elongated word. Should this be the case, you can create additional notes by highlighting a note that is at least 2 beats long and pressing CTRL+"-" (on the main keyboard, not the numpad) to split the note. 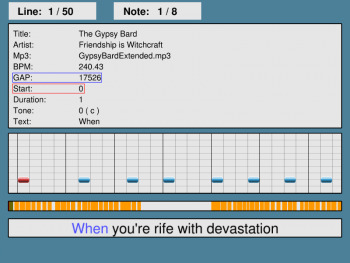 This can be used to check long notes where you are not quite sure if they have already ended or not. Create an extra note and shuffle it around until you can just not hear the word when pressing P. Now extend your note to that position. Afterwards, you can delete the added note by pressing CTRL+Delete. If you want to change the text, you have to press F4. You can change multiple words by pressing Left/Right, and leave the editing mode by pressing ENTER. If you are using a keyboard setting other than US, doublecheck the words you've entered. USDX is quite eccentric whether it leaves your native keyboard or switches to US. Sometimes, you'll want to change linebreaks as well. If you want to merge lines, select the earlier one and press SHIFT+"-" (again, not numpad). You might need to switch lines to update the text, though. If you want to cut a line in half, select the word you want to be the first of the new line, and press "-". If pitches are too high or low (can happen if you import files from Composer), the new line might not be displayed correctly. In this case, save and reload the song for it to fix itself. Now starts the fun part: tuning. If you happen to have a songsheet of the song, you're extremely lucky. 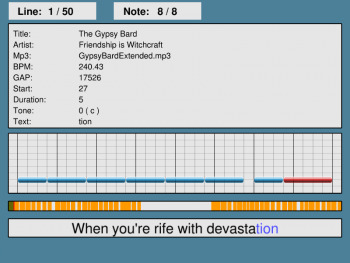 You can convert the musical notes to their pitch, and use it to tune the notes. Odds are you won't, though. At this point, you only have your ears to go by. Press SHIFT+Space, then Space alone, then raise/lower the pitch with SHIFT+Up/Down until it matches the song. It's a bit trial-and-error at first, but you'll get an ear for it eventually. Also, most songs use around 5 pitches reagularly, with the odd sixth or seventh strewn in. If you feel the song is much higher/lower than the starting pitch (0), you can increase/decrease the whole song's pitch by a whole octave by pressing SHIFT and Numpad+/-. Pressing Numpad+/- alone will in-/decrease the pitch for the whole song by 1. Good if you feel that you got the melody pinned down, but want to test out some different starting pitches. Just be sure to set it back to the original value once you're done. By using SHIFT+P, you can listen to the pitch of the whole line. This can be useful since sometimes every individual pitch sounds about right, but in unison it just sounds wrong. If you have spoken text in your song, you can fade it out by pressing F. Keep them on the starting pitch, as they will still be shown on Performous. Now for some finishing touches: Golden Notes. Select a few notes in the song and press G. Those will be worth double points. These should be either hard-to-reach pitches, long sustained notes or important words in the text. Or just space them out equally throughout the song as you think it fits. On a perfectly sung song, Golden Notes should value around 1000-1500 points, and never over 2500. Remember that long sustained notes in otherwise short songs (eg. the second "honey" and "Everything" in So Many Wonders) weigh heavily on the score, and can easily push the Golden Note score beyond 2000. For more information on USDX, and a few keyboard shortcuts you might find useful and I might have forgotten to mention, check the "documentation.pdf" in the Ultrastar DX installation folder. During your playtest you probably noticed that sometimes the lines switch too early or too late. That's nothing you can fix with USDX, you need to adjust that manually in the .txt-file. You can read about that here and in my comments here. If you have background/cover pics, just adjust the filenames in the #COVER and #BACKGROUND lines. as well. Note that while the gap is given in milliseconds, the videogap is in seconds, so start off with something like 0.5. The number can be negative as well. After you're done, copy the content of your .txt in [ CODE] into the WIP thread. Also include links to pics, video and audio, if those aren't provided already. We'll do a run-over, add some project details and upload the song for you, if it's good enough. We'll have download options for individual songs soon. If there's anything you want clarified, just ask away. Keep this thread to general questions, though. For specific songs, ask them in the WIP or Feedback section. Very good guide, this will help a lot of newbies. One thing, though: VBR to CBR encoding is bad, really bad. You loose a lot of quality while possibly even enlarging the actual file. If you are serious about your song, always go for the original .wav, .flac and then re-encode it yourself to mp3 CBR. (For the HQ releases I would go for 320kbit/s, for the low-res ones for mp3 192kbit/s). We should also keep these uncompressed audio files around, since we might need to re-encode them at a point in the future and karaoke is all about the music, less about video. Suprisingly VBR allready said 'no' for me without that I had to do anything... Is that possible? With all great things, comes a great responsibility. Can someone check this text for me? It's from Blackgeyphon - proud to be a brony. And I'm trying to find out what to with the +, - and ~. No I probably wouldn't tell yo+~+u what was really on my mi+~+nd. when it feels so good in+~+siiiide! but shies away from her own kind? Why can't I mention Pinkie Pie? And the way she kind of acts a bit like me some+tim+es? For though they tell me I'm the one with probl+ems, they're the ones who are in+sane! So for those watch but won't admit it; well you shouldn't be like that. Cause you could be twenty percent cooler in ten seconds flat! How she will try her hoof at an+y+thing just to get a little thrill? Why don't you mention Apple Jack, and talk about her honest southern style power of will? I'm proud to be a bro+ny! But even though she's prim and proper, she could make it in a fight! could take an Ursa any day! So how about you? Would you do what I do, or be phony? You proud to be a brony? I tried Composer and UltraTools Editor for fine-tuning the notes and really have to say that the on-board editor in USDX is superior in terms of setting the position and length of the notes. The positioning of line breaks, however, is problematic (as you pointed out). For this, I prefer UtraTools Editor over manually editing the TXT file. What do you think of including a mention of the USDX documentation file in your writeup ("documentation.pdf" in the USDX installation directory)? It is not mentioned "inside" USDX and no link is put in the start menu folder of USDX in Windows, so it might well be overlooked by someone who is looking for even more information. Unfortunately, I know little to nothing about encoding, and this software offers a quick and easy way to make sound files Ultrastar-ready. I'm not enough of an audio-connoisseur to be able to tell the difference most of the time, anyway. But that's me. It is, and it's a good thing. 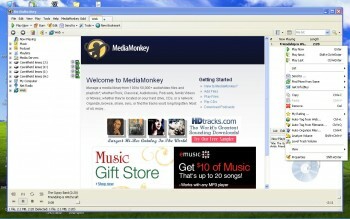 Only some HQ audio files use VBR. The positioning of line breaks, however, is problematic (as you pointed out). For this, I prefer UtraTools Editor over manually editing the TXT file. Haven't tried that one. Basically, I'm OK with doing it manually, anyway. That way, you can doublecheck the overlapping notes, as well. EDIT: Done. Thanks for the tip. @evillander: as mentioned, I wanted this thread to be for general questions, only. It's for your own good, too. I "lost" quite a few posts on other boards because I couldn't remember what thread they were posted in. But if you post it in the WIP thread, I'll be glad to help. Wait, you have to press spacebar at every syllable? Isn't there an easier way? Or can you use the pause button? Also you can pause, undo the last tap whenever you want to and advance / go back in the song, from what I've seen. You can use the pause button, as well as the slowdown feature, but you still have to tap every note manually. It takes a bit, but you'll get used to it eventually. The only easier way is if you have a midi of the song and import that, but I haven't covered that. Added this info to the tutorial, as well as some editing advise for the USDX part. I manually created a song file (including background.png, cover.png, notes, and song.mp3) from scratch and basically replicated the folders that are used for the other songs, but exchanging some information (i.e. title, notes, etc.) to fit the song I was making. However my song file still doesn't work on the game. Do I have to use the programs listed on this forum page? You do not. Could you post your .txt in the [ CODE] tag in a separate thread? Then we can check what went wrong. Sure, just to let you know I only have a single random note placed in the song. This is because I wanted to check and make sure that it would load properly. Playing the piano and singing is my life! I´m currently working on a German version of "Helping Twilight win the Crown" and got a little problem. The "hey" is written in the lyrics but doesnt appear as a note on-screen. How do i do that? Those are freestyle notes. In the .txt file, their lines start with F instead of :. Depending on the editor you're using, there might be various way to achieve that (for instance, a right-click in Composer, hitting the "F" button in YASS, or pressing "F" on your keyboard in the Ultrastar build-in editor) - which one are you on? I´m using the built in USDX editor, but i already found the documentation.pdf in the main folder! EDIT:Did i say part 2 i meant part 1 Oops. Get out of my head! I've been struggling to get PVZ 2 to update for the last few days. Anyway, what does this, in any shape or form, have to do with My Little Karaoke?